Minor and Major Medical Care 24 hours. Our 24-hour College Station Emergency Room (ER), located at 1512 Texas Ave S, Suite 500, College Station, TX 77840 treats most major and minor medical emergencies for adults and children. Residents of College Station, Bryan, Edge, Reliance, Tabor, Wellborn, Benchley, Kurten, Snook, Millican, Astin, Mumford and Clay TX can visit our nearby 24-hour emergency room and receive professional emergency medical care locally 24/7. Our College Station ER also serves residents of Carlos, Independence, Lyons, Navasota, Caldwell, Singleton, Somerville, Anderson, Hearne, Planterville, Huntsville TX and other areas surrounding 77840 zip code. Our Emergency center is a fully-equipped, freestanding emergency room providing hospital-level care in a neighborhood setting. The licensed ER nurses and board certified physicians at our College Station TX emergency room provide high-quality immediate care without the long wait times of major hospitals. We treat common illnesses, minor injuries, critical emergencies and we are open 24 hours a day, year-round, to provide emergency care services. Our College Station ER offers personalized emergency care – always from board-certified physicians – in a convenient modern facility. SignatureCare Emergency Center strives to provide all our patients with excellent care. College Station, Bryan TX and nearby communities are able to visit us and receive the highest quality emergency medical services. Our patients wait ten minutes or less at our modern and state-of-the-art facility. For those patients who require additional observation, we have obs rooms for you to be monitored overnight. Treatment of minor injuries, like cuts that require stitches or staples, contusions, abscesses, and other medical emergencies. We accept most private health insurance and Workers’ Compensation. Each member of our staff is a certified health care professional and the well being of our patients is our highest priority. 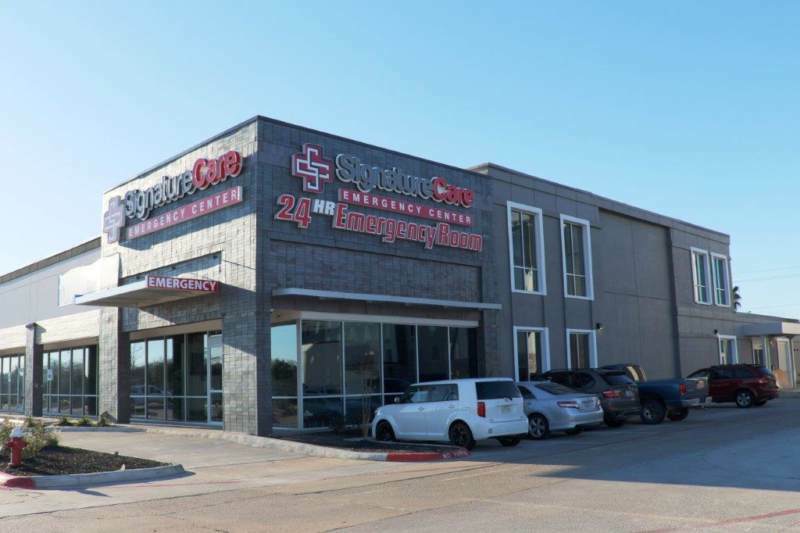 SignatureCare Emergency Center – College Station also serves Bryan and surrounding cities. We are here 24/7 to provide you with the medical treatment and care you and your family deserve. Take a right on Texas Ave.
Make U-Turn at George Bush Dr.
Dr. D. Kirk Vakey is a board-certified emergency medicine physician. He is from the Texas Hill Country. He was a U.S. Marine and San Antonio Fire Fighter before medical school training at The School of Medicine San Antonio, Texas. He did his residency in Emergency Medicine at Vanderbilt University. He had been practicing emergency medicine throughout the Memorial Hermann Hospital system since 2012. Dr. Vakey joined SignatureCare in January, 2016 with the opening of our TC Jester location. He has served as the medical director of the College Station location since its' opening. In his free time he enjoys spending his time with his wife Korie and their 2 children.